Let’s do this Gurus! Let’s help our friends and families. Let’s spread the word that fruit is not the enemy when eaten in the right quantities and shouldn’t be categorised into ‘high and low fructose’. In a time where statistics show that Australian’s are not eating the recommended amount of fruit, let’s spread the word that fruit contains a gabillion health benefits including the ability to reduce the risk of cancer, heart disease, kidney disease, organ damage, Type 2 Diabetes and can promote weight loss. It can help us live a longer life. It’s a gift of nature! Life is far to complicated and stressful to be stressing about whether a banana is going to make us fat, because it won’t. It sounds all snazzy and scientific all this ‘fructose talk’ but guess what, it’s not. Added table sugar is a different story, but this article is about natural sugar found in fruit. SHARE if you wish to spread the word. 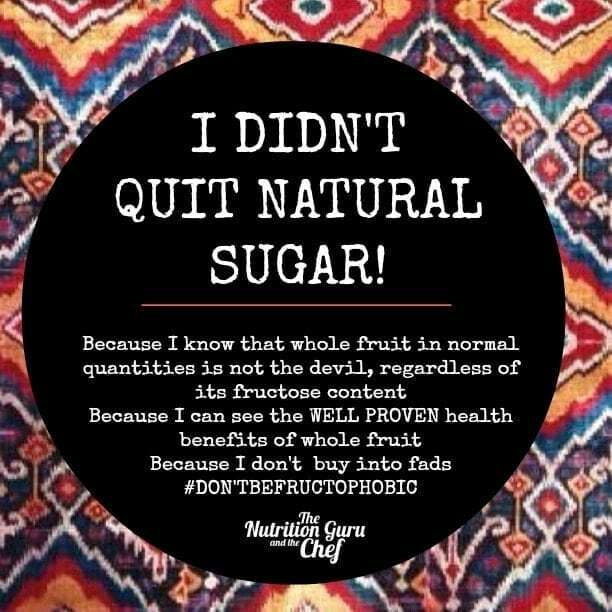 Pin it, Facebook it, tweet it and let’s stop this no fruit or low-fructose-only silliness!